The following is my translation of a statement posted in Arabic by Moaz el-Khatib, head of the Syrian National Coalition of Revolutionary and Opposition force, on his Facebook page. The Halfaya massacre was not committed by the Syrian regime without help. Whoever acquiesces to it is an accomplice to shedding Syrian blood. Reticence on the massacres being committed against the Syrian people translates into blackmail and coercion of the people, their revolution and leadership. All political solutions being floated around are unacceptable when they bypass the Syrian people. We told every official we met: Keeping the regime and its head in place – with or without powers – is totally unacceptable to Syrians. After 20 months of sacrifices and the shedding of the Syrian people’s blood, how can anyone suggest maintaining the status quo until 2014? The sitting National Coalition leadership let Lakhdar Brahimi know the rejection of this solution in plain words. Any political solution to redeem the regime is unacceptable. A political solution is one that spares Syrian blood. 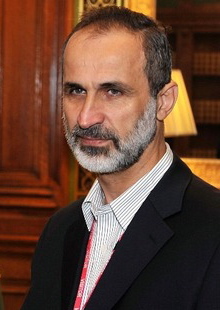 Any solution that does not commence with Assad stepping down is refused and one we have to abort. The Halfaya outrage was not just one more massacre. It was a communication from all regime supporters saying: You either die or accept the servitude we dictate. I say forcefully: We choose freedom no matter how long it takes.